Webometrics (www.webometrics.info) issued latest 2014 July World Ranking of Universities. 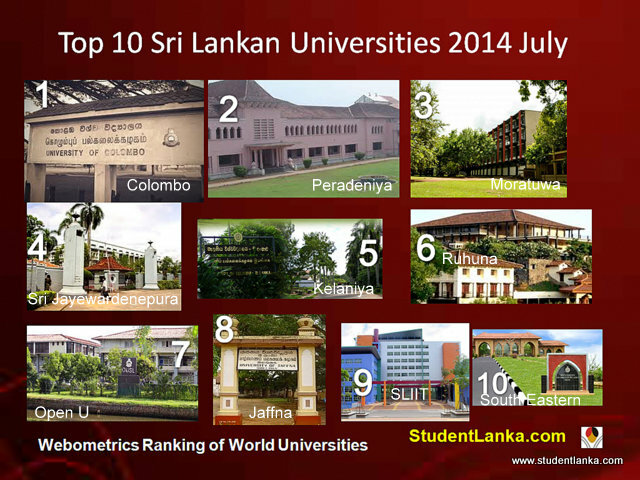 According to this 2014 July ranking University of Colombo, Peradeniya, Moratuwa, Sri Jayewardenepura and Kelaniya became the best five Universities in Sri Lanka. It is interesting to note that none of the Sri Lankan Universities are among the top 1000 universities in the world, highest ranked University in Sri Lanka is Colombo and it became the 2146 th University in the world, and 24th University in South Asia. According to this ranking Harvard, MIT and Stanford Universities in USA become top three Universities in the World. According to webometrics site they calculate World Ranking according to following criteria. IMPACT. The quality of the contents is evaluated through a “virtual referendum”, counting all the external inlinks that the University webdomain receives from third parties. Those links are recognizing the institutional prestige, the academic performance, the value of the information, and the usefulness of the services as introduced in the webpages according to the criteria of millions of web editors from all over the world. PRESENCE (1/3). The total number of webpages hosted in the main webdomain (including all the subdomains and directories) of the university as indexed by the largest commercial search engine (Google). It counts every webpage, including all the formats recognized individually by Google, both static and dynamic pages and other rich files. OPENNESS (1/3). The global effort to set up institutional research repositories is explicitly recognized in this indicator that takes into account the number of rich files (pdf, doc, docx, ppt) published in dedicated websites according to the academic search engine Google Scholar. Both the total files Both the total records and those with correctly formed file names are considered (for example, the Adobe Acrobat files should end with the suffix .pdf). EXCELLENCE (1/3). The academic papers published in high impact international journals are playing a very important role in the ranking of Universities. Using simply the total number of papers can be misleading, so we are restricting the indicator to only those excellent publications, i.e. the university scientific output being part of the 10% most cited papers in their respective scientific fields. Although this is a measure of high quality output of research institutions, the data provider Scimago group supplied non-zero values for more than 5200 universities (period 2003-2010). In future editions it is intended to match the counting periods between Scholar and Scimago sources.